It's been a very strange Easter for me this year. I believe this is the first one in my lifetime that I've not spent a great deal of time in church for. I've missed more Sundays since having my first child than I did over the course of my entire childhood and pre-baby adulthood, combined. I also haven't been able to attend Masses for the Triduum and haven't braved the Vigil since that time, but I have still made it out on Easter morning. Tom and I talked at length about trying to make it today despite being only hours out from bringing home a new baby, but neither of us really had the energy to take our recently-expanded brood anywhere. My mother offered to watch the older two for us while we attended with Mia (since I'm her only food source, she pretty much has to go where I go for now), but I was still a little nervous about bringing her in public so soon after such a bad flu season. And ultimately, we were all feeling pretty wiped when morning rolled around, anyway. On top of that, I keep suffering setbacks in my recovery because it's hard to take it easy around here with three babies, even with Mima's extra help. I've been feeling especially sore all day today, and bone tired. Apparently, I wasn't the only one. Mia's spent about 98% of her day like that, which is fine by me. Whether worn or held, as long as she's up against a warm body, she'll sleep through pretty much anything. It's taking some time to get her to sleep independently for longer than 30 minutes or so, uninterrupted, but we're making slow progress. In general, she's proving to be a pretty easy-going baby thus far, and I pray that the trend continues. She's also been a real champ at breastfeeding, though we hit a bit of a hurdle today when I woke up so engorged at 3 am that I was in too much pain to let down. Even a hot shower with massage, pumping, and time under a heating pad haven't brought much relief, though things seem to be slowly improving as the day goes on, and Mia has slowly been able to coax more out of me. I feel sad that I missed out on the most beautiful part of Easter- the liturgy, but at least we were still able to spend the holiday with family. Mia, Granda and Mei Mei hung around for most of the day, and though our Easter ham turned into a bit of a disaster when the glaze had some sort of reaction to the aluminum foil that Tom draped over it, we had some roasting chickens to substitute for a lovely dinner. I also regret that I didn't have the energy to dress up my kids for an Easter picture. Nana did buy a special bib for Mia, but there's been no good time to put it on her, as she's pretty much only woken up to eat, and then fall back asleep again. 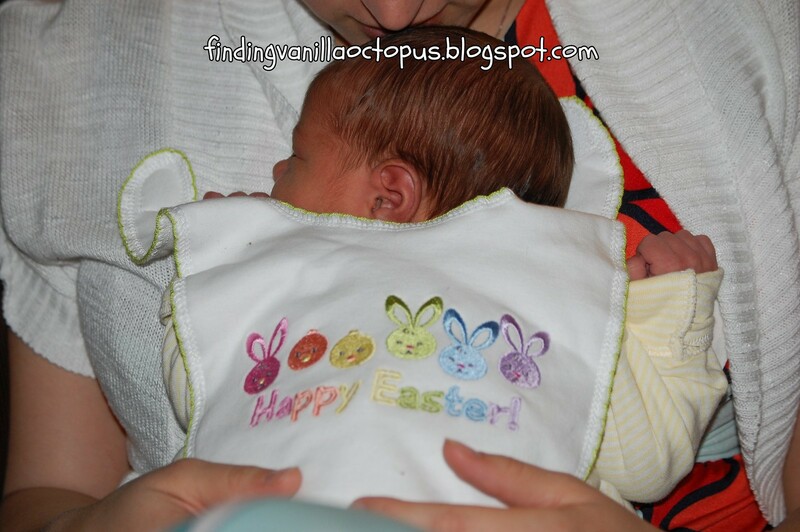 I was determined to get at least one Easter-themed shot it, though, so I draped the bib over her back as she napped with Mei Mei.